The Divided Brain. What does it mean to think? This is the third in a series of posts I am making following a four-day course with Iain McGilchrist. Details of the course, which will run again next year can be found on the Field & Field website. I found this day the hardest of all four days to get a handle on, but hopefully the process of working through my notes by recording them here, and having a long walk on this beautiful Spring day, will help me to make sense of them. The talks were framed around the phrase ‘I think’ with the morning focusing on ‘Think’ and the afternoon on ‘I’. Iain started by saying that there is no objective reality – but there is an underlying reality that is there for us to respond to. All thinking – imagining, remembering, cogitating, pondering and so on – is about making things up; all thinking is creative. Creativity is about stopping and allowing it to happen – relating to the world. Thinking can be thought of as ‘methinks’ – it seems to me – or more literally ‘it thinks to me’. So thinking is something that comes into mind. Max Scheler believed that thinking is out there, not in the brain. There are different kinds of ways of knowing the world and thinking about it; the kind of knowledge that comes from experience (phronesis); knowledge that comes from more information (episteme); techne-knowledge that a craftsman has; and theoretical wisdom (sophia). This relates to Dreyfus’ work on adult skill acquisition, which Iain referred to later in this talk and which I mention in more detail below. Almost all the thinking we do we are not aware of. Even when unconscious we are planning, reasoning, making decisions – hence the expression ‘Sleep on it’. Thinking and believing: Belief does not mean signing up to reasons. From ‘Lief’ meaning ‘beloved’, belief is about a process, a relationship. Truth is also always about relationship; being faithful or true to one another. Trust has the same root as truth. All thinking, believing and notions of truth are tentative and need to be tested. It is not about certainty but about bringing into becoming. These processes are always two-way. Meaning, emotion and reason are not distinct. Thinking and feeling can’t be separated. To think is to thank. Thinking is not made up by reason. It is not certain, unidirectional and detached. Thinking is receptive and grateful. It is relational. Mind relates to ‘to mind’, which relates to ‘to care’ again suggesting a relationship. Thinking is deeply connected with feeling (feeling probably comes first) and is an embodied way of sensing, which the RH tries to appreciate. The brain seems to ‘ready itself’ for thinking before the thinking takes place. Thinking and bodily preparation for action are closely related, but abstract thought closes down action. All thinking is dependent on the body. Understanding depends on models and metaphors. A metaphor is how we make a connection between a word and an embodied experience. We tend to see ourselves as machines, but machines can be predicted and controlled and we can’t do this with humans. For example, computers and machines will never take over the work of therapists, i.e. a machine could not take the place of the ‘listening therapist’. We are not ‘things’. We are more than the sum of our parts. The RH is the hemisphere that attends to the whole, the LH to the parts. ‘There are, then, two widely different ways of attending to the world.’ (p.43, The Master and his Emissary). In talking about the issue of reduction versus holism Iain referred us to Addy Pross’s book ‘What is Life? in which Pross writes (p.50) ‘… – the seeking of generalizations, the recognition of patterns – is at the core of all scientific understanding’. Pattern recognition is the work of the right hemisphere. ‘The right hemisphere sees the whole, before whatever it is gets broken up into parts in our attempt to ‘know’ it. Its holistic processing of visual form is not based on summation of parts. On the other hand, the left hemisphere sees part objects.’ (p.47, The Master and his Emissary). 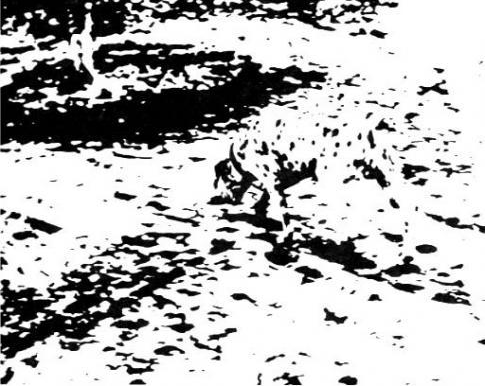 As an example of this we were asked if we could see the pattern in this image. Of course, once you have seen it, you cannot ‘un-see’ it. The RH is also more active when looking at ambiguous figures such as in the figure below. 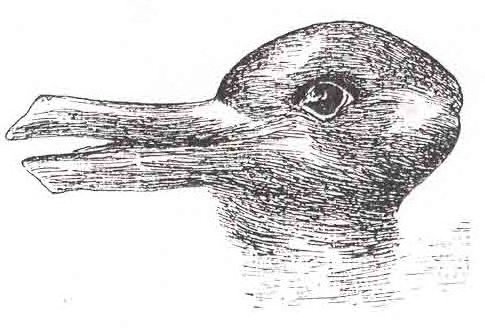 In this image you can see either the duck or the rabbit, but you cannot see both at the same time. The RH is more tolerant of this uncertainty. Iain went through many more examples of right and left hemisphere differences with particular reference to the images in Chapter 2 of The Master and his Emissary. Iain then went on to refer us to Dreyfus’ work on adult skill acquisition, which is summarized in this Table, taken from their paper, p.181 (see reference list at the end of this post and for a larger view, click on the image). My understanding is that Iain used this reference as another example of reduction versus holism. As beginners when learning a skill it is helpful to have some rules (see the comments section of my first post in this series, where there is reference to close reading of poetry and the fact that more structure can be helpful for novice poetry readers). But beyond Skill Level 3 (see Table 1) rules hamper the process and at Stage 5 reflection doesn’t help. We don’t want our surgeons to be referring to a rule book when making life and death decisions, choices are not always a good thing and research has shown that when we have time to review a choice, we often end up making a worse choice. Here Iain referred us to Barry Schwartz’s book – The Paradox of Choice. I interpreted this as meaning that the ‘expert’ takes an intuitive holistic view. For the novice, the skill is first seen by the RH as totally embodied. This is then broken down into individual components when thinking moves to the LH. Ultimately when the level of experience means that the skill is intuitive, there is a return to the RH. Embodied Thinking and Emotion: Our bodies are not assemblages of parts. There is a direct link between the heart and the brain via the vagal nerve. The heart feeds back to the brain, not just pain, as in the case of chest pain associated with heart conditions, but also in relation to other conditions such as epilepsy and depression. We talk about having a ‘heavy heart’. Depression is a condition of the heart and research has shown that after heart surgery there is an increase in the instance of depression. ‘… there is evidence that in all forms of emotional perception, regardless of the type of emotion, and in most forms of expression, the right hemisphere is dominant’. ‘… the strong universal tendency to cradle infants with their faces to the left, so that they fall within the principal domain of attention of the adult’s right hemisphere, and they are exposed to the adult’s own more emotionally expressive left hemiface.’ (p.61). Reading this makes me stop and think about which side of my face I present when interacting with others. The RH is more willing to accept someone else’s point of view and is more able to feel someone else’s pain. The value of slowing down, silence and stopping: This was mentioned quite a few times during the course, i.e. that for creativity, stopping doing things is more important than doing things. We started and ended this session by being reminded that we need to create the mental space for quiet receptivity and more careful attention. Creativity is not just letting things all fall out; we also need to bring critical things into play. There was a lot more from Chapter 2 (What do the Two Hemisphere’s ‘Do’?) of the Master and his Emissary in this session, which I have not mentioned here. The message I took from this session is that we have not given enough attention to the right hemisphere’s role in thinking, it’s role in believing, feeling, emotion, embodied perception, pattern recognition and creativity, and that we should be more aware of the relationship between these and thinking. Anthony Damasio (2005). Descartes’ Error: Emotion, Reason, and the Human Brain. Penguin Books. Lakoff, G. & Johnson, M. (1999). Philosophy in the Flesh: the Embodied Mind & its Challenge to Western Thought. Basic Books. Lakoff, G. & Johnson, M. (2003). Metaphors We Live By. University of Chicago Press. Addy Pross (2014). What is Life? How Chemistry becomes Biology. Oxford University Press. I love reading a ‘modern’ take on my studies back at university 🙂 Dreyfus and embodied cognition were pretty controversial in my time…I am getting old. It is interesting to note the integration of these ideas into more main stream thinking and as I read I make some associative trails with the work of Bohm. Silence matters for so much more than quiet. Hi Mariana – Dreyfus’ work was only mentioned very briefly by Iain McGilchrist, and my notes were scant – so I have had to read around a bit, to include it in the post. I hope I have understood it correctly. I seem to remember Bohm being mentioned during the 4 days, but I don’t think I made a note of it and I have a terrible memory. As Iain McGilchrist kept reminding us, we are very selective in what we pay attention to! 🙂 I liked my sentence too so look what I made: https://flic.kr/p/rvcBYV There was a recent Daily Create that asked for an Inspirational Poster and I used the sentence for the poster! Happy to write more about it, now we have the graphic! I see that his worked has touched you deeply and that is lovely to witness. Thanks for sharing your great graphic Mariana, which has sparked off all sorts of thoughts. I’m looking forward to seeing what you write about it. I hadn’t really thought that Iain McGilchrist’s work has touched me deeply, but now that I am nearly at the end of writing up my notes, I can see that it has – and also that it resonates on so many levels with all the other work I do and interests I have. So thanks for pointing that out to me.